This page will discuss different ways you can best utilize AlphaViril™ for maximum benefits and results. With thousands of satisfied users, we've had numerous "cycle" options reported back to us for optimal usage and performance. Please read the below "cycle" information, as we have designed a few to suit your specific needs. 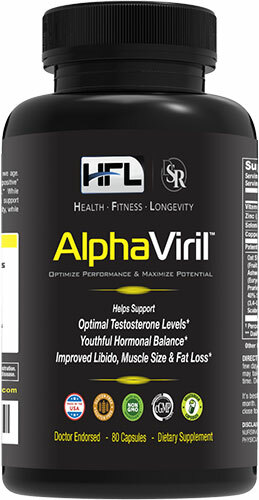 IF you are a first time user of AlphaViril™, it is best advised that like any new supplement, you first start off at lower dose the first 2-3 days, simply to see how your body reacts. What is a "little" for some people, may be a LOT for others and vice/versa. Start low, test only 1 or 2 capsules at a time and if you feel good, then go ahead and begin using higher recommended dosages found below, so you can see and feel the maximum benefits. This is a practice you should use with any new supplement you begin taking. First time users, take 1 pill in the morning and 1 pill in the afternoon. After a few days, increase to 2 pills, 2x daily for a total of 4 pills (morning and noon). If needed, you may take another 1-2 pills, later in the day (afternoon). Do not exceed 2 pills at any given time. Do not exceed 6 pills daily. Take on an empty stomach (15 min before a meal) with a glass of water. Do not take close to bedtime, it may keep you awake. At first, try lower dosages and see how you react. If the desired results aren't achieved, then increase the dose until you achieve your goals. Again, the above are just examples used successfully by others. You may want to experiment and create your own "cycle". Just remember that with the above, 4-6 pills are the typical daily dosage. It's best not to use more than 2 pills in one day. You don't need to cycle (because you don't have testicles) and you can use it continuously. Never use the product if you are pregnant or trying to get pregnant (this should be for almost ALL supplements). Never use the product if you are currently taking birth control pills as the change in hormones may interfere with how your pill works. Simply stated, you need a much lower dosage then men, just 1-2 pills daily is about right. Again, the above mentioned were reported cycles from some of our users. See what best suits your current life style and goals, select one of the above sample cycles and get started. Nothing is set in stone and some times, you'll need "it" more than other times. So, feel free to experiment and see what works for YOU. And if all you need is just ONE capsule a day, then GREAT ... save money and enjoy it! Remember, the body tends to adapt to anything - that's its survival mechanism. By varying your dosage and cycle pattern, you'll always get the full benefits, at the lowest dose possible!